Female friendships can be some of the most rewarding relationships that women have in their lives. They can also be some of the most complicated. Think, Betty and Veronica in the Archie comics. Not always blissful, but those girls needed each other, and not just in their fight over Archie. And despite the fact that it’s not always sunshine and roses (what is, really?) I wouldn’t trade my besties for anything. They’re crucial to my well-being, my mental sanity and yes, my overall happiness. I’ve posted in previous blogs here both here and on wordbitches about some of the physical activities that I get involved in. In those posts, I’ve alluded to my ‘training partner’ and now it’s time that she get’s pulled out into spotlight for the recognition she deserves. Together we've achieved SO much! Deb and I met through our kids, only a year apart and both boy/girl twins, they knew each other before we did. I can’t remember exactly how we got talking and I first learned that Deb was a runner, but I do remember somehow convincing her that I too was a runner (at the time I was pretty much a wannabe runner). I remember totally bluffing about how much running I really did do, because I wanted to go for a run with this super upbeat, marathoner chick. Her attitude was infectious. She was so damn positive and I was hoping some of her marathon greatness would wear off on me. I guess my bluff worked because we went out on a weekend run together. It was awkward, I struggled…but somehow I got through it and a new training partnership was born. It wasn’t long before we were running together a few times a week, then we ended up in swim club together. 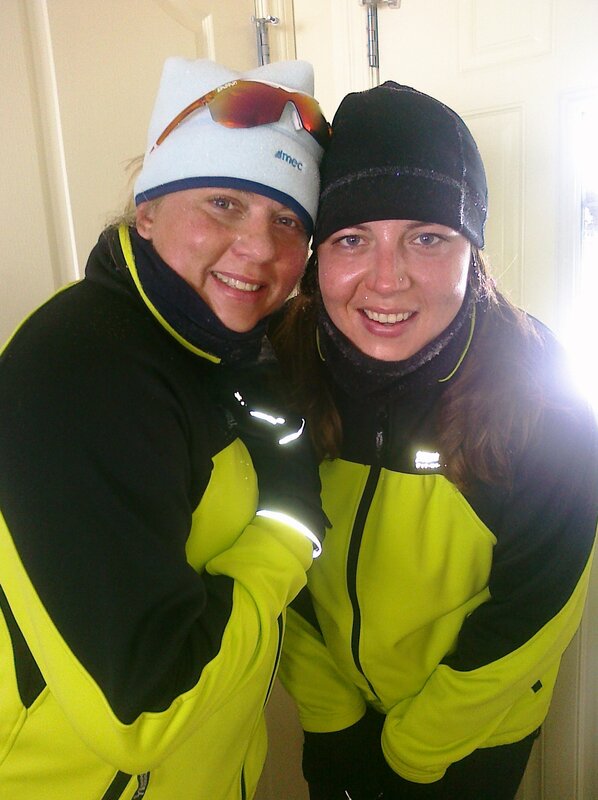 I talked her into doing a 200 km bike ride with me and soon, our training schedules were completely enmeshed. The only one who will run long with me in -20! Deb and I had been training together for months before I learned that she is a Type 1 diabetic and wears an insulin pump. Her disease is part of her, it by no means, defines her. The thing I notice most about Deb and her diabetes is not that I, as her training partner, has to know where her sugar pill is on long runs, or that she can get cranky (like, really cranky) when her sugar is low, but that she excels in spite of it. When so many others (without any health issues) can’t even begin to imagine themselves accomplishing what she has, Deb’s just busy planning what’s next. One of the greatest things about a bestie is that you can be yourself and they’ll love you because of it and sometimes in spite of it. We’ve training together for a few years now, and the phrase, “what’s said on a run, stays on a run” has been put to good use. There’s no better way to get to know someone than by going on a series of long (four-hour plus) training runs with them. That’s a lot of time to talk. Of course, silence is golden too. BUT the best part is when you DON’T run out of things to talk about. Sign of a bestie. So, here’s to my Super Duper Training Partner PLUS Bestie for pushing me to reach my goals, for believing that I can, showing me how it’s done, and doing it all with me step by step! So how about you? Tell me your stories about your best friends. Do they push you? Make you a better person in any part of your life? Share because they deserve the recognition! In sickness and in health…that’s what best friends are for, right? When Addison announces she has breast cancer, her best friend Rori knows she’ll do whatever it takes to see her through it. Because after all, what’s Betty without her Veronica? AVAILABLE FROM AMAZON – FALL 2011! What a wonderful friendship you and Deb share! It’s such a special bonus in life to be so fortunate. My novel The Bridge Club is about 8 women who have shared an amazing connection for over 40 years. It’s based on my real-life bridge club and attests to the power of friendship. It sounds like you know all about that. 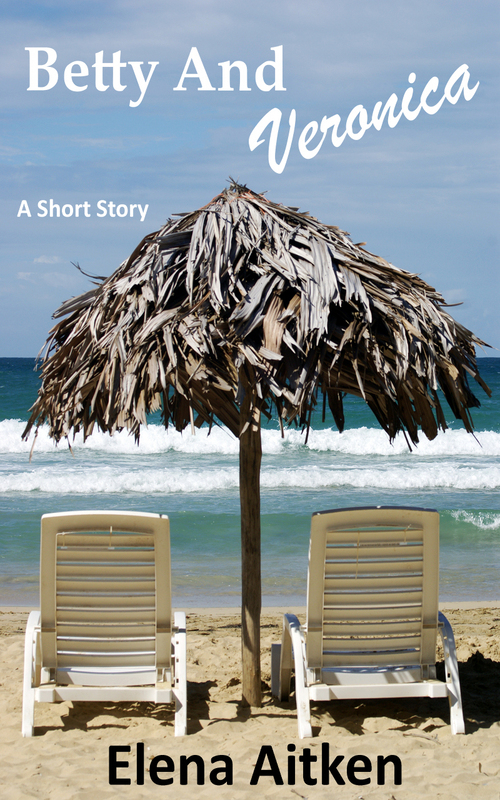 I’m wishing you the best of luck with your short story release! Keep us posted. we do share a wonderful friendship. I LOVE books about women and their relationships because really, they are THE most complex I know about. Everyone needs to pick up your book! Aw, so cool you have a bestie like Deb. What an inspiration she is! Thank you for sharing this peek into your friendship and life. Thanks for stopping by! Deb is a pretty cool bestie to have. And yes, a full on inspiration! What an incredible story about the power of friendship. Beautiful. I have a few gal pals in my life that I couldn’t imagine my life without them. They bring joy, love, support, comfort, strength, laugher, and a million other gifts into my world…and in times of trouble, they are a girl’s best cheerleading squad! I remember the day I found out my best friend told my X-father-in-law to go “fawk himself” when he had the nerve to call me trash. She said it out loud, in public, and in a large group before stalking off. No one had ever stood up for me like that before. She was my defender and my protector when I needed it most….I will always stand by her as fierce! We are lucky to have each other. And…get on your bike! I have a deep love for my bike. Deep. Congratulations on having a best friend who shares so many of your interests. My bestie is my sister, Carol. We have been there for each other more so in the last ten years than ever before. We only live 20+ miles apart so we get together whenever I need to go to town (I live in a small town in the boondocks) to the Whole Foods grocery for gluten-free products, the bookstores, Dillards, eye doctor, etc. Since we both write, we can discuss writing, brainstorm ideas, commiserate over rejections, discuss current WIP, changes in publishing, etc. We talk to each other at a minimum of twice a week, usually three or four, if I haven’t been to town. You guys share a great bond! I love friends like that! Deb really does sound like an inspiration as well. I had shivers reading about this – the way you described Deb and how she *lives* (in the full sense of the word) with diabetes. Kind of hits me today because it is my sister-in-law’s birthday. And it’s also the day of her fourth chemo treatment. Her middle grade novel – her first – is scheduled to come out in 2013. That’s the good news. Hopefully she’ll have much more good news to report in the near and not-so-near future. Hey….that’s my wife! Great article Elena. I think the same about her. I love my besties! Yes, the relationships can be tough at times, but hanging there and working through the difficulties makes it worth it. Shoutout to my critique buddies! Shoutout to my lifelong buddies (friends since kindergarten).